This is a recipe that one of my cousins developed when she was in high school. She won a national cooking contest with the recipe and as I remember the prize was a new stove. 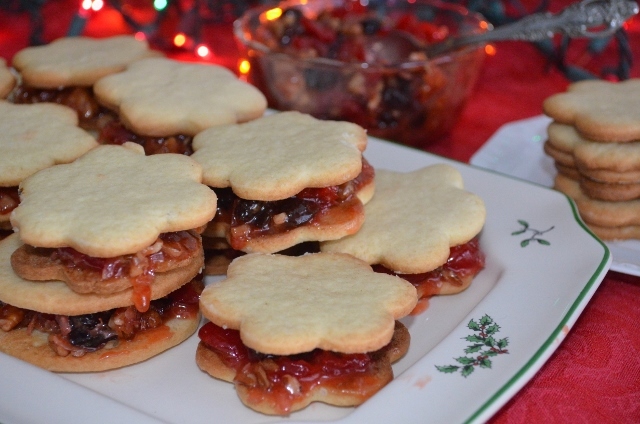 The recipe uses a filling similar to the Lady Baltimore Cake between two buttery cookies. I usually cut the recipe in half as the cookies very sweet and a little goes a long way. Place slightly beaten egg yolks in sauce pan. Add sugar and butter; cook over low heat, stirring constantly for about 5 minutes or until slightly thickened. Add rest of ingredients and mix well. Cool before spreading between cookies. Cream butter until soft. Add sugar gradually and continue mixing until very creamy. Beat eggs slightly, then stir eggs and vanilla extract into creamed sugar. Sift flour baking powder and salt together. Add alternately with milk to butter mixture. Roll out on lightly floured board to about 1/4 inch thickness. Cut with cookie cutter and place on ungreased baking sheet. Bake about 12-15 minutes or until slightly brown at edges. Remove from pan and allow to cool. Spread filling between cookies. What an unusual recipe! 🙂 Kim x http://www.eatsleepbakerepeat.wordpress.com. Thanks, they are chewy with a lot of good stuff in the filling. Thanks a lot. I don’t make them very frequently but they are good when I do get around to doing it. These look like a tea party!! so pretty.